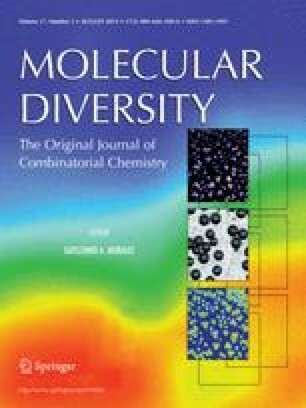 A series of silica gels and mesoporous molecular sieves differing in both the range of particle size and mean pore size were derivatized with the p-[(R,S)-α-[1-(9H-fluoren-9-yl)-methoxyformamido]-2,4-dimethoxybenzyl]-p henoxyacetic acid linker and their loading capacities were measured. Loading capacities ranging between 0.4–0.6 mmol Fmoc/g were achieved. Several of these silica based materials were derivatized with the hydroxymethyl benzoic acid linker and used as supports for the solid phase Claisen rearrangement of a support bound phenyl allyl ether. Both the silica gel and mesoporous supports were heated at 225 °C for 3 h to effect the Claisen rearrangement. The results showed that, compared to the same reaction run homogeneously, the silica gel support achieved similar total product yields and ratios for two Claisen products. The mesoporous supports were found to selectively produce one of the Claisen products over the other. Analysis shows that the molecules bound to the mesoporous support are physically further separated from each other as compared to those bound to the silica gel support. A mechanism is presented which accounts for the selectivity of the mesoporous support in forming one Claisen product over the other. The Claisen product was further derivatized to the resulting phenyl ethyl ether through a solid phase Mitsunobu reaction on the mesoporous support.